Dientje Kalisky was born in Bussum, Holland on May 20, 1938. She was just four years old when she went into hiding in 1942, and was eight when she was reunited with her parents. Dientje has memories from before the war and detailed accounts of her experience in hiding. She explores not only the physical pain and trauma of the Holocaust, but also emphasizes the long-lasting psychological effects that such an experience has had on herself, her surviving family, and even her children. 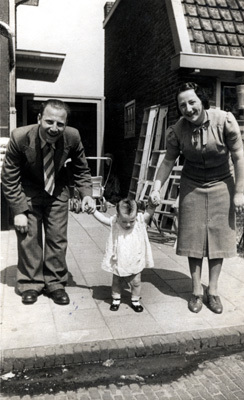 Dientje with her parents, Phillip Krant and Evaline Krant (née Hamel); 1939, Bussum, Holland, in front of their home, 24 Hoogeweg.